Look up. Look at that. 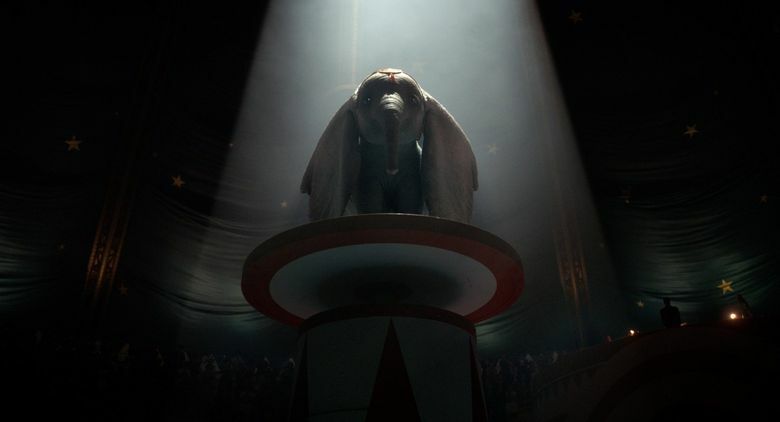 Time and again throughout “Dumbo,” Tim Burton returns to images of crowds with heads tilted back and eyes rapt at the spectacle of an elephant soaring overhead, propelled aloft by iconic oversized ears. “You’ve made me a child again,” a man remarks, awe-struck at the spectacle. Burton and screenwriter Ehren Kruger have expanded and extravagantly re-imagined in live-action form the beloved 1941 animated Disney classic in ways that engender a sense of delighted wonderment. It’s not quite twice as long as the 64-minute original, and Burton fills the extra time with colorful, eye-popping visuals that serve a multilayered and very moving story. It’s a perfect fit for Burton, aligning nicely with his affinity for misfits and odd ducks. The man who brought Pee-wee Herman, Beetlejuice and Edward Scissorhands to the big screen is right at home with a sky-riding pachyderm. This is arguably the most family-friendly movie Burton has ever made, of necessity owing to the gentle childlike nature of the title critter. Young kids love Dumbo because he is, in all respects, a kid, a baby actually, with his awkwardness, innocence and yearning for his mother’s love. Handle with care. And Burton does. His taste for the bizarre is less emphasized here. Scares and surreal moments are kept to a minimum, although one particular surreal scene, featuring giant floating pink bubbles in the shape of elephants, ties this “Dumbo” directly back to the original and its famously out-there pink-elephants-on-parade segment. Several other elements link the two pictures, from Dumbo’s winsome blue eyes to the song “Baby Mine,” which was nominated for an Oscar in 1942. Other elements, like Dumbo’s best buddy, a talkative mouse, and a flock of fast-talking crows have been jettisoned. 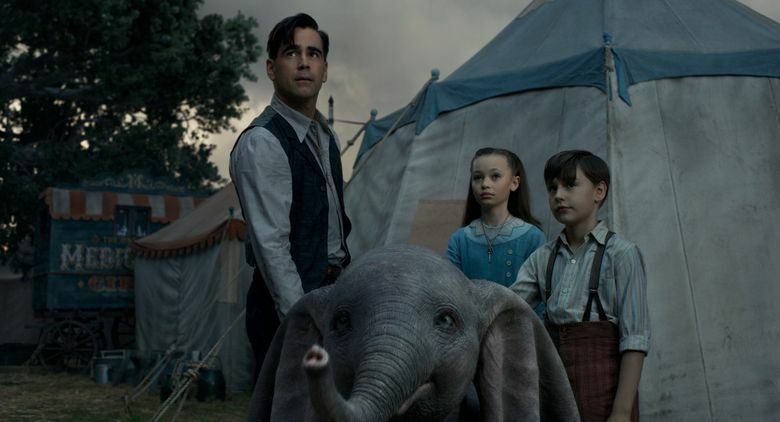 In their place, this new “Dumbo,” set in 1919, is built around a human family of two young children, Milly and Joe (Nico Parker and Finley Hobbins), and their father, Holt Farrier (Colin Farrell), a circus performer returning home after fighting in World War I. With Holt having lost an arm in combat, his wife having died in a deadly influenza epidemic and the kids having been raised during their father’s absence by his circus-performer friends, the Farriers are a damaged family. 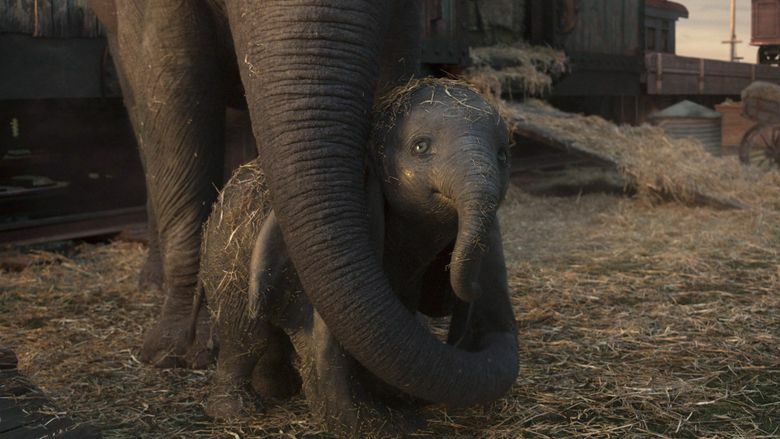 Caring for Dumbo helps them heal. 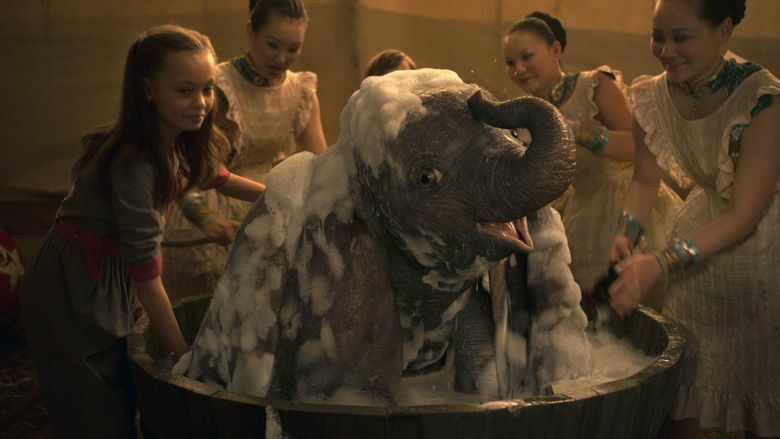 Dumbo (a CGI creation) is himself a damaged creature, being mercilessly mocked at the outset for his outsized ears and being forcibly separated from his mother. The picture, like the original, is about his path to a hoped-for mother and child reunion. 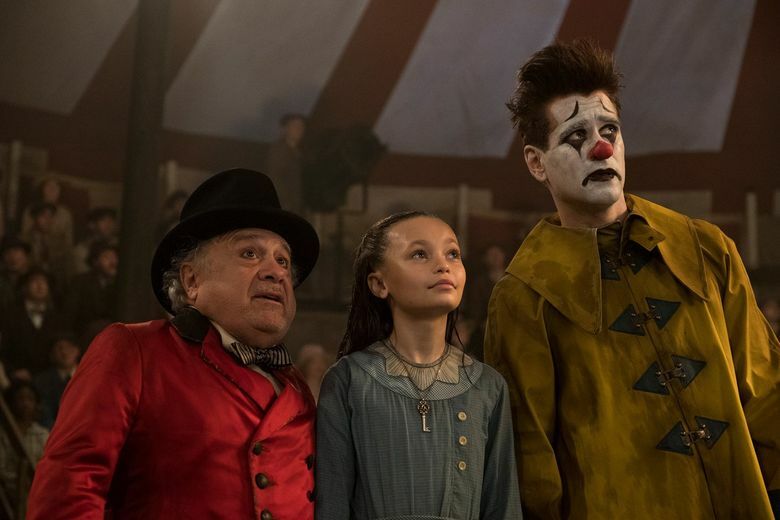 The circus to which Holt returns is a threadbare outfit run by Max Medici (Danny DeVito), a blustering fellow, stubbly and clad in a stained undershirt at the start. 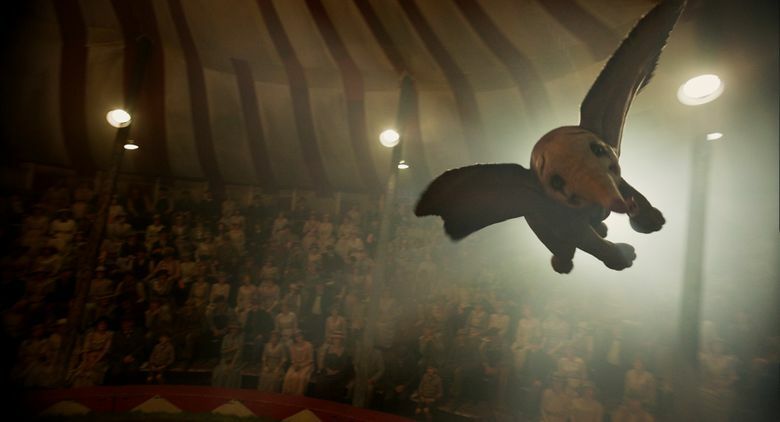 Everyone’s fortunes dramatically improve when Dumbo learns to spread those ears and take flight, instantly becoming the circus’ sellout attraction. Dumbo’s newfound fame attracts the attention of V.A. Vandevere, a wealthy impresario played by Burton favorite Michael Keaton (their relationship dates back to “Beetlejuice”). With a big, insincere smile and a peculiar white hairstyle, he seduces Max with an offer of making him a partner in his sprawling new amusement park, Dreamland (with its rocket ride, lavish pavilions and Main Street parades, think: Disneyland). The shabby circus is the past, Vandevere tells Max. The ultramodern Disneyl-, sorry, Dreamland, is the future. Vandevere’s companion (Eva Green), a strikingly beautiful trapeze artist, wants Holt to know Vandevere is not what he seems. Burton’s command of this material and his masterful visual sense makes this “Dumbo” an engaging delight. Like that winsome elephant, it really does soar. 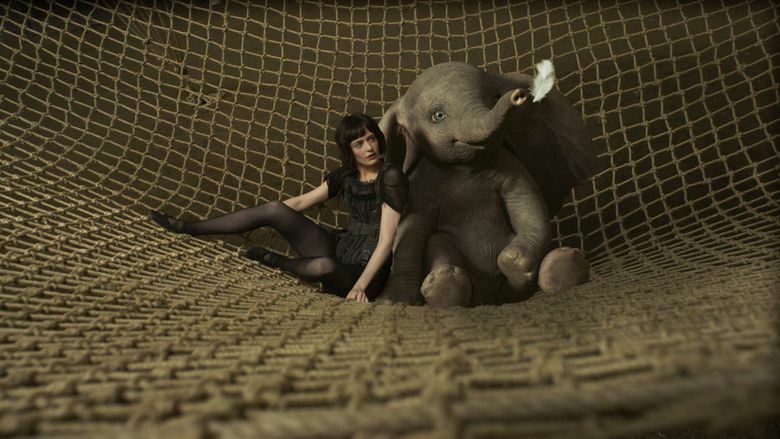 ★★★½ “Dumbo,” with Colin Farrell, Danny DeVito, Eva Green, Michael Keaton, Nico Parker, Finley Hobbins. Directed by Tim Burton, from a screenplay by Ehren Kruger. 112 minutes. Rated PG for peril/action, some thematic elements and brief mild language. Opens March 28 at multiple theaters.